With a feature dubbed "Noise Blackout Extreme," the Jabra Extreme clearly takes noise cancellation seriously. 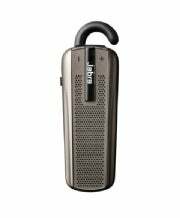 Priced at $80 (as of June 28, 2010), the Extreme plants the company's latest audio technology in a lightweight shell to create an excellent-sounding unit that's ready for the noise of the big city--or of a busy household. Though not as stylish as the Aliph Jawbone Icon, the Extreme's silver, electric-razor-like microgrill body is attractive and functional. The dual internal microphones worked quite well in my tests. The 0.35-ounce device comes with a handful of ear gels for proper fit, along with two earhooks and Bluetooth 2.1+EDR (enhanced data rate) support. The company says that its Noise Blackout Extreme noise cancellation technology reduces extraneous sounds twice as well as the Noise Blackout technology used in older Jabra headsets. I found it difficult to quantify that claim; but certainly the updated technology worked very well even with loud music playing in the background. The person at the other end heard what amounted to muffled background music while my voice over the Extreme came through clearly. Incoming audio was good, with ample clarity and little static or other problems. Though the Extreme supports A2DP for streaming music from digital music players, some functions (such as remote volume control) don't work with some devices, including the iPod Touch. The Extreme can connect to two devices at the same time, automatically giving priority to a ringing phone. The unit has a simple on/off switch and a raised center button for connecting and disconnecting calls and for pairing. Unfortunately, the volume control buttons on either side of the center button are somewhat hard to find because they're almost flush with the body. The Extreme automatically adjusts earpiece volume in response to ambient noise, and a sound monitor protects your eardrums from sudden volume spikes. The Extreme also supports voice commands on compatible phones. The Jabra Extreme comes with a small, folding USB charging adapter; a 12-volt car/USB adapter; and an AC/USB adapter. Jabra rates the Extreme's built-in lithium polymer battery at up to 5.5 hours of talk time and 10.5 days of standby time per charge. On balance, the Jabra Extreme is a good, reasonably priced choice if you want to make sure you can be heard clearly at the other end in noisy environments. This sleek-looking headset works well in noisy environments.